Municipal Hurricane swing bolt filter housings provide effective performance with up to 20% in energy savings. Their design combines three filters into one compact package. 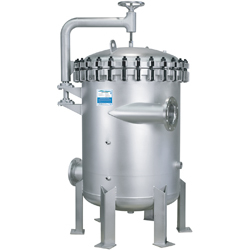 The outer chamber acts as a cyclonic separator and separates dense solids prior to polypropylene-flow cartridge filtration for extended filter life, increased dirt-holding capacity, fewer maintenance intervals and reduced operating costs.